Last week I attended a fantastic seminar on fall gardening and cleanup, which was hosted by the recently reopened Comstock, Ferre & Co. in Wethersfield, Connecticut. Those in the know, much longer than me, remember the days of Comstock, Ferre. Known as the country’s oldest continuously owned seed company, and the region’s premiere supplier of seeds, the business was recently purchased by a young couple from Missouri who also own Baker Creek Heirloom Seeds. 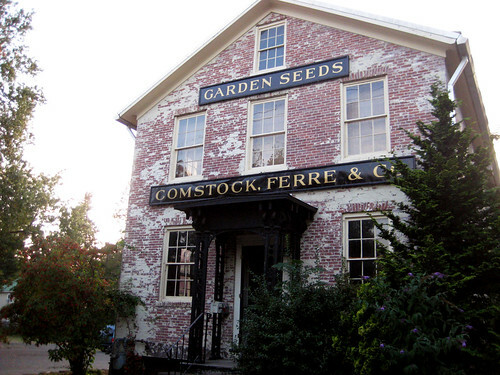 Comstock, Ferre now focuses on heirloom seeds, local artisan products, and antiques. Caroline Finnegan of Ladybug Landscaping, an organic landscaping and design company, was our discussion leader for the evening. Let me tell you, Caroline knows her stuff. Ask her anything. From compost, to making your own sustainable potting soil, how and when to water, crop rotation and soil amendments, she knows. She also writes regularly for Going Home to Roost. Creating Next Spring’s Garden. October 14 @ 6:30 p.m. If you’re local, make a point of stopping in. Seven dollars gets you a whole lot of information and a fun experience! ETA: As I write this, it seems something funny is happening over there. The company site is down, and one of their employees was laid off. Stay tuned. That sounds like it was a great class. I love the old building. It’s so beautiful.